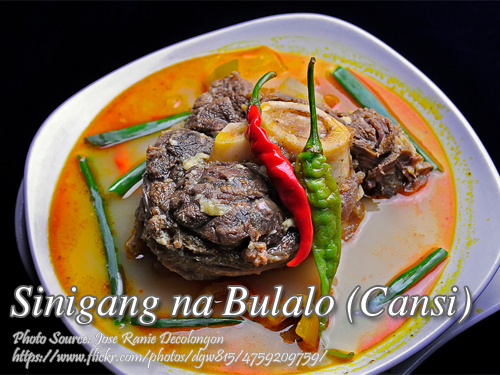 Cansi is a famous beef soup dish of Iloilo and Bacolod. It is suppose to be the combination of two well known Filipino dishes, beef bulalo (beef shank with marrow soup) and beef sinigang (beef in sour broth). But actually the vegetables used in sinigang and bulalo are nowhere near to the cansi. The ingredients that are used the cansi are lemon grass, annato, langka and batwan (or batuan) that are not found or used in bulalo or sinigang. Batwan is a souring agent used by Ilonggos and the areas of west Visayas. (In this recipe kamias is used as a substitute for the batwan. Just in case kamias is also not available, instant sinigang mix can be used.) So if you don’t live on these areas, I think this fruit is unknown to you. Usually the souring agents are tamarind, kamias, guava and some use unripe mangoes or probably what souring agent is indigenous to the region. If this dish is not familiar with you, I think you should give this nice dish a try with its aromatic flavor because of the lemon grass and reddish/yellowish broth that is appetizing. In a pressure cooker, heat cooking oil and fry the annato seeds until the color is extracted to the oil. Remove the seeds from the oil and discard the seeds. In the same pressure cooker, saute garlic and onion until the garlic is slightly brown. Add in the tomatoes and saute for a minute. Then put the beef shank and sear on all sides until slightly brown. Add water just enough to cover the beef shank. Cover and pressure cook for 30 minutes or more until tender. If the meat is already tender, add in the tanglad, batwan (or kamias), salt, pepper, chili peppers and jack fruit. Simmer until the jackfruit is tender. (Don't put the lid this time or you will overcook the meat and the jackfruit.) Serve hot.